Mrs. D.C. America speaks candidly about her life and reign of a wonderful year. Deep inside the dream of most every little girl is to become a contestant or better yet, to win the coveted title of a pageant queen. 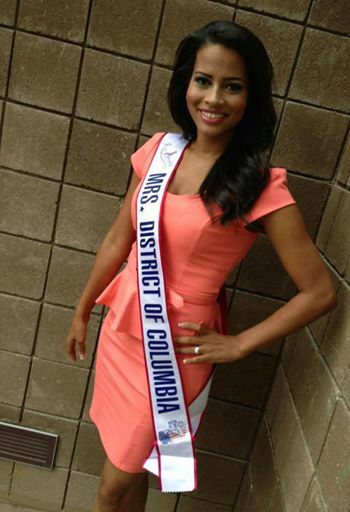 In this case the dream became a reality for Meagan Barnes, Mrs. District of Columbia America 2013. Copa: Meagan, where were you raised? Meagan: I was born in Columbia, Maryland and raised in Odenton, Maryland. At the age of 25 I moved to Virginia. There is something about the DC Metropolitan area that appeals to me. Old Bay seasoning is something I grew up on and there is something marvelous to enjoy crabbing and fishing on the Severn River on the weekends with my Dad and brothers. Copa: In High School, were you ever considered to be an outgoing person? Meagan: In High School I was always very busy. Between school work, sports and even working part time at age 14, there really wasn't much time for anything else. We had three hour practices on weeknights and six hour practices on Saturdays . I would say I was pretty outgoing though. There is something about laughing, joking around and having fun. Being on the Basketball team really brought me out of my shell since there was a great support system and relationships established with my teammates. Copa: Who in your early life impressed you so with their personality to a point where you wished to emulate them? Meagan: Since I love Basketball so much Michael Jordan was the one person who impressed me the most. He was such an exciting player to watch. His game was just so polished and he was so much better that everyone else. I would watch all of the Michael Jordan and the Chicago Bull games, and the next day I would be outside trying to recreate his moves from the night before. Copa: What is your opinion on today's style? Meagan: What amazes me is how certain things have come back into style. I remember when I was younger, I was wearing certain things that were popular and they would later go out of style. Now I see kids walking down the street and I can only laugh and think about how I wore the exact same thing in elementary, middle or high school. Also all colors seem to be gender neutral now which I like. For instance my son wears neo sneakers, (yellow, pink, green). It seems like the world is a much colorful place and I like it. Copa: When was your first pageant, and were you nervous? Meagan: The 2013 Mrs. DC America pageant was my first pageant ever. Never did I imagine I would be crowned Mrs. DC America or even be competing in a beauty pageant. I entered the Mrs. DC America pageant for the sole purpose of being able to use my voice to speak out on mental illness. It was a bit nervous leading up the to the Mrs. DC America Pageant but I had a great coach, Tracy Jameson, who helped me practice interview and state questions. Also Raquel Riley Thomas, Director of Mrs. DC America held numerous workshops leading up to the Pageant that helped me as well. 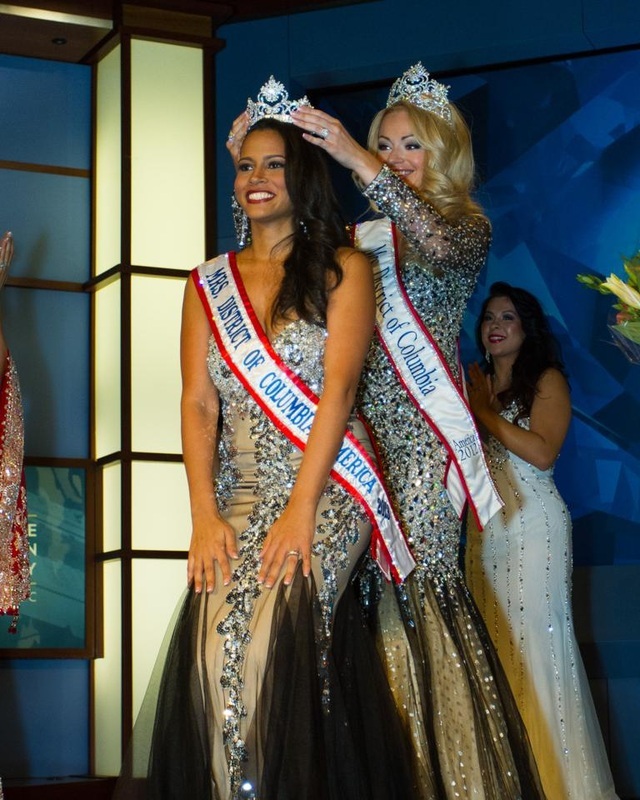 Copa: How would you describe your year as Mrs. DC America? And would you like to do it all over again? Meagan: This last year was wonderful, I would not change anything about it. It has taught me so much about myself, about the world, and about life in general. I have taken away so many life lessons from it and I have become a more outspoken and driven person because of it. Copa: What advice would you give for any woman today who wishes to broaden her self esteem? Meagan: The most important piece of advice I would give is to make sure you take care of yourself mentally and physically. You will be happier, more grounded and healthier if you take charge of your life. I believe we spend too much time worrying about other people, there opinions and what they think. It's fine to take others advice into consideration when making decisions that effect you, but ultimately YOU control your destiny and you should not be easily influenced by what others think or have to say. Copa: We know that you are an outstanding person in many ways , but how would you define yourself in the area of style and fashion? Also, have you ever done any modeling? Meagan: Yes, I have done modeling in commercials, print and even in the "Face of Beauty" campaign for "Elf Cosmetics" back in 2010. I really enjoyed modeling because it is always different. There are never the same two modeling jobs or shoots and I had the opportunity to work with some amazing photographer, stylists an makeup artists. Now as far as my style and fashion, I'm a tomboy at heart. Nike gear and sneakers also appeal to me, I wear them a lot around the house when lounging. This year though, there has been more emphasis in fashion for me with the numerous events, appearances, especially with the "Nationals". Now I have a pretty extensive wardrobe and shoe selection. A few of my favorite designers are Calvin Klein, Ralph Lauren, Elie Tahari and Trina Turk. But to be honest, I wear anything that I like whether it's a name brand or not. Copa: We understand that you are the founder of Women Conquering Anxiety, would you please share with our readers what this organization is all about? Meagan: Women Conquering Anxiety is a social media outlet for women who are going though Anxiety, Panic, Agoraphobia, Depression etc. I started it in 2012 and we have grown into a community of 4,000 women. I share my experiences with anxiety, my challenges, and tips that have helped me when you are going through Anxiety you often times feel alone. Also many times it is not until you are aware that other people are experiencing the same symptoms as you that you even realize it is indeed anxiety that you have. You can find daily inspiration messages and post to help you get through your day. Even a simple "Don't give up" post can help someone more than you think. We also have a separate private group where women can get more personal support. And aside from that I run a local meet up group in the DC/NoVa area for women to be able to connect with other women who are going through similar situations. Copa: What does the future hold for Meagan Barnes? Meagan: Well my year as Mrs. DC America 2013 has been such an amazing experience for me and I cannot wait to crown the next Mrs. DC America on March 8, 2014 at the Jack Morton Theatre at George Washington University. I encourage everyone to come out and enjoy the event. Every single one of the ladies competing is doing so much for the community. I also will be involved in a local show aimed to erase stigma surrounding mental illness. It is called "This is My Brave", the event will take place at the Artisphere in Arlington, Virginia on May 18, 2014. In a few weeks, I graduate from the Institute for Integrative Nutrition with a certificate in Holistic Health. I am combining that with my experiences and recovery from Anxiety, Panic Disorder and Agoraphobia to help other women. Also there will be an online program I will be launching in the near future. What else, the sky is the limit right? Although I do not plan on competing in another pageant, this has nothing to do with my competitive spirit. It's just many more goals in my sights for right now...I'll keep you posted!